Zeb the Duck is back! 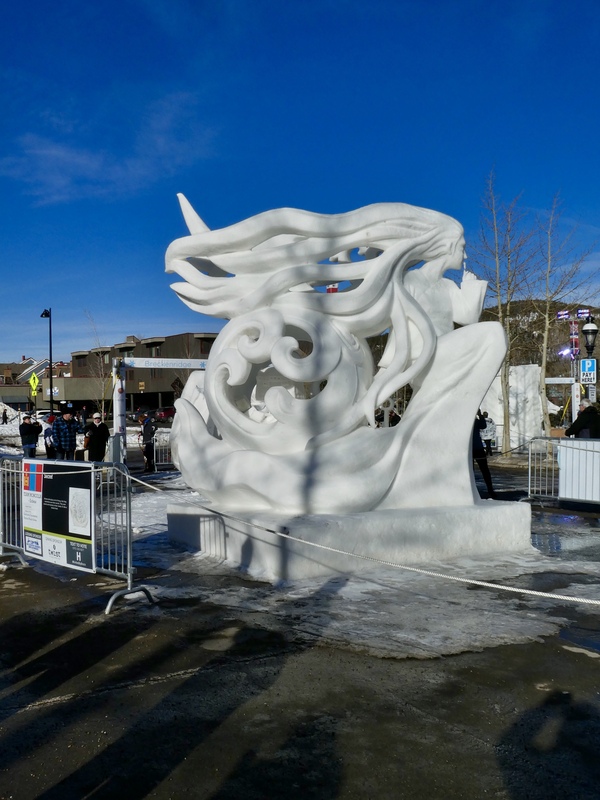 The International Snow Sculpture Championships in Breckenridge, Colorado, one of my favorite festivals, was last weekend. Let’s go look. 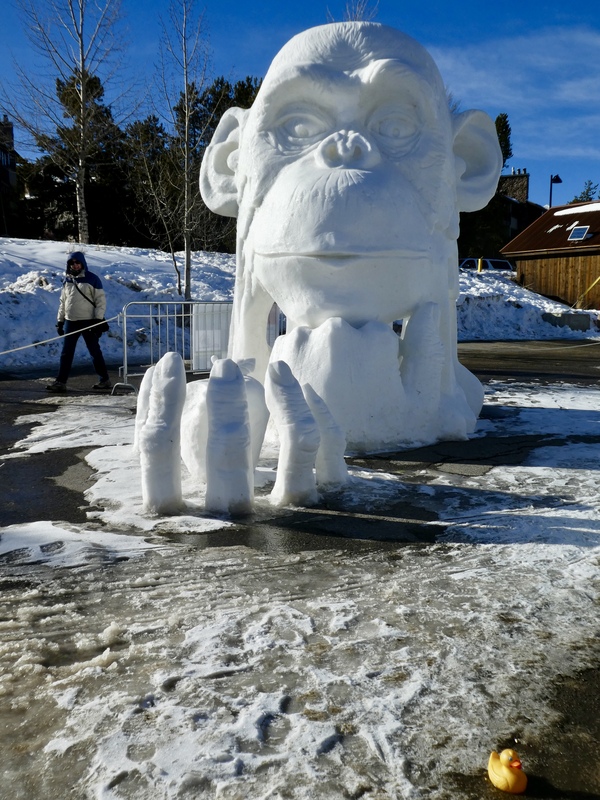 Let’s go see the snow sculptures! This one did not win an award, but I loved it. Team Turkey says the mind is an amazing machine. When a man and a woman develop a relationship, they become connected at the deepest level and their minds work as one even when they are apart. The bumps on the top are a zipper to put the two minds together. Here is the other side of this sculpture. Even the pupils of the eyes are carved in snow. 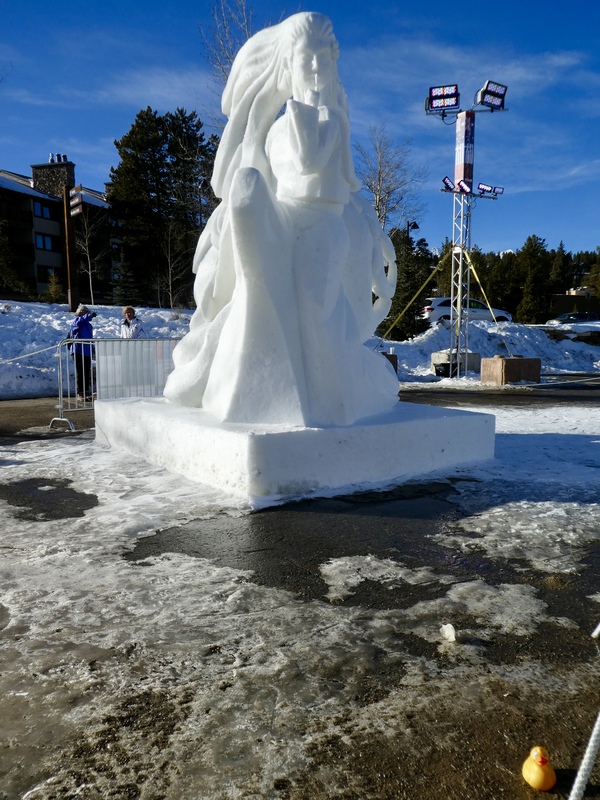 These sculptures, carved from 25 ton, 12 foot tall blocks of snow were finished and judged Friday evening. We visited them Monday. And look what happened over the weekend. This creation from Team USA Wisconsin, A Dance Devine, collapsed after being awarded 3rd place. This was three leaf like figures dancing within a vine structure. 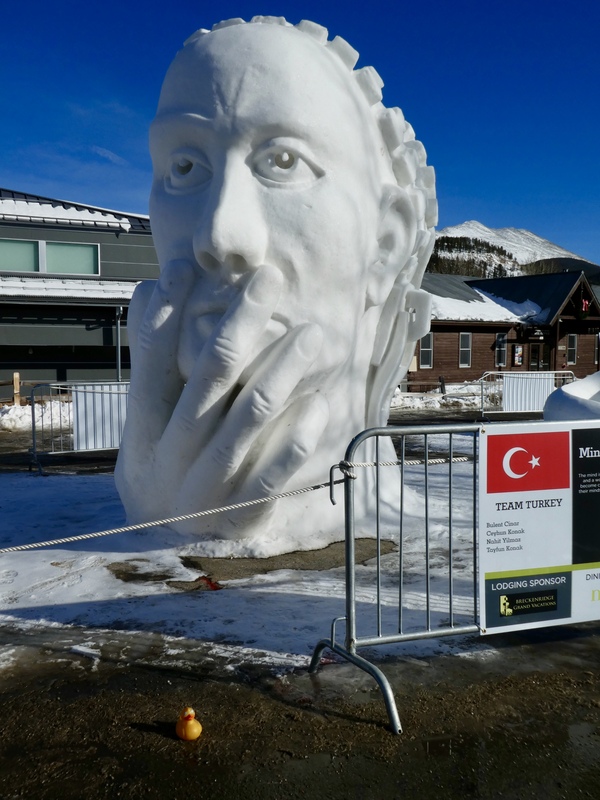 At 9,600 feet (2,926 meters) above sea level the intense Colorado sun can be brutal on snow sculptures, but the sun with 30 degree (F) temperatures are delightful for human and duck spectators. The Thinker crafted by Team China earned 2nd place this year. The Thinker also won Kid’s Choice award. The apple represents wisdom in the Bible and it represents gravity in Newton’s law. In modern times it represents technology. The orangutans represent humans. This design means thinking is a necessary part of human evolution. To enter the competition each team submits their design and a brief explanation of their sculpture. We appreciate the help understanding everything the artists are trying to express in their sculptures. First place went to Team Mongolia-Erdene. This is titled Secret. Women talk about a lot of things. But they sometimes save their secrets. They save secrets and mystery in their minds. It’s like a locked chest. A side view of this creation. Secret also won People’s Choice Award. Glad this do not melt and fall. The Artists’Choice Award was bestowed on Time. This sculpture by Team Mongolia-Tserendash was a favorite for me, Zeb the Duck. Time is the most powerful thing in the world. It is honest because no one is given more than 24 hours a day. It is immutable because no one changes the rhythm between minutes, seconds, and doles. It is forceful because no one can survive from death; even the smartest one, the strongest one, and the most beautiful one eventually gives up along the time that goes gradually and endlessly. But, the humans use time in their own rhythms, in relatively different way. How they use time develops who they are. 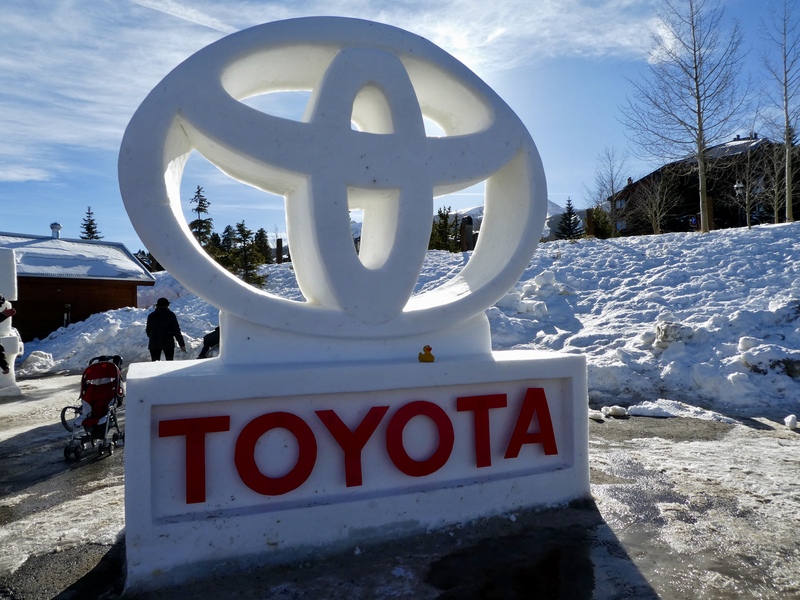 This 28th Annual International Snow Sculpture Championships was presented by Toyota. 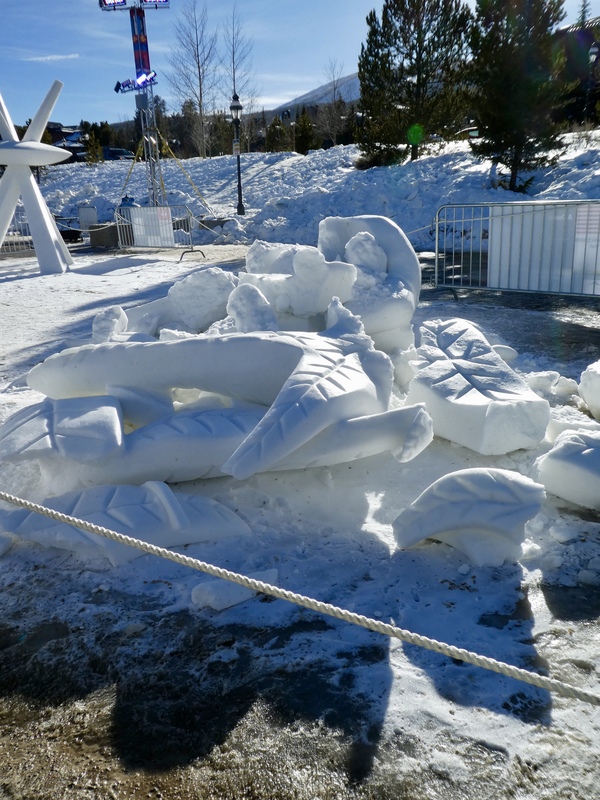 You may remember from prior years here, that no power tools are allowed in the creation of these snow sculptures. All hand tools, sometimes as small as a potato peeler, are used on these snow blocks. So interesting to see and notice so many little details. There was one more sculpture I want you to see. 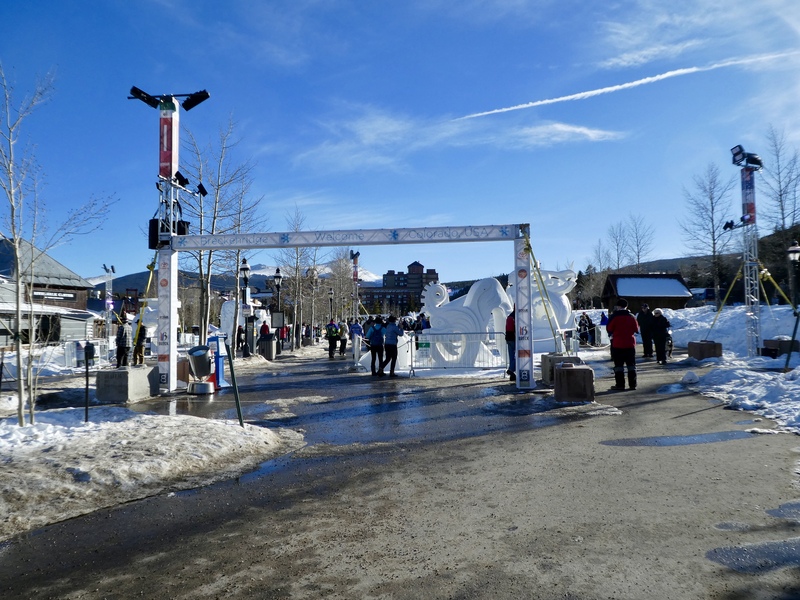 Catch & Release by Team USA Breckenridge, Colorado. It is about the adventure, not just the prize. Taking a journey down to the river in pursuit of catching a fish is less than the whole story. This fisherman says after the fight, you finally reach down to collect your prize, unhook your lure, smile at your accomplishment and then just turn around and release this magnificent award back to nature. At the end of it you take home nothing more than a sense of relaxation, a picture and a few fish stories. Catching and releasing; a way to ensure that the fish will be there the next time to strike the fly and create the next memory. The fisherman is done for the day, and so am I, Zeb the Duck. We hope you are exploring and enjoying your home town and our incredible world. Thanks. Those sculptures are always beautiful and intricately done. We love to see them. Sorry you missed them this year, but maybe next year. Thanks for reading and commenting. Amazing sculptures. Glad to see you back again, Zeb. Thanks! Glad to be back. 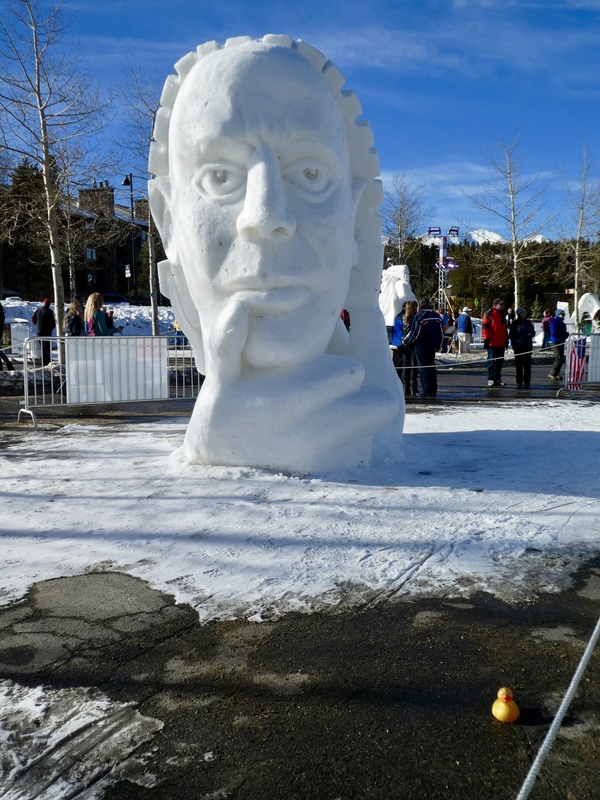 We love snow sculptures and we love Breckenridge. Thanks for reading and commenting. 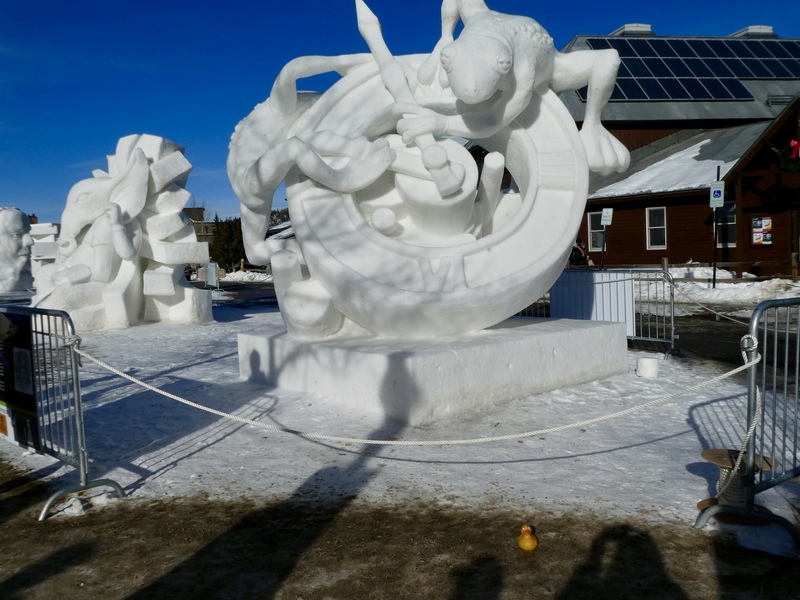 We love the snow sculptures and try to see them every year. We (ducks and humans) love Justin Beaver! Looking forward to his next adventure. Thanks for reading and commenting. Wow! Some of those sculptures are so intricate. 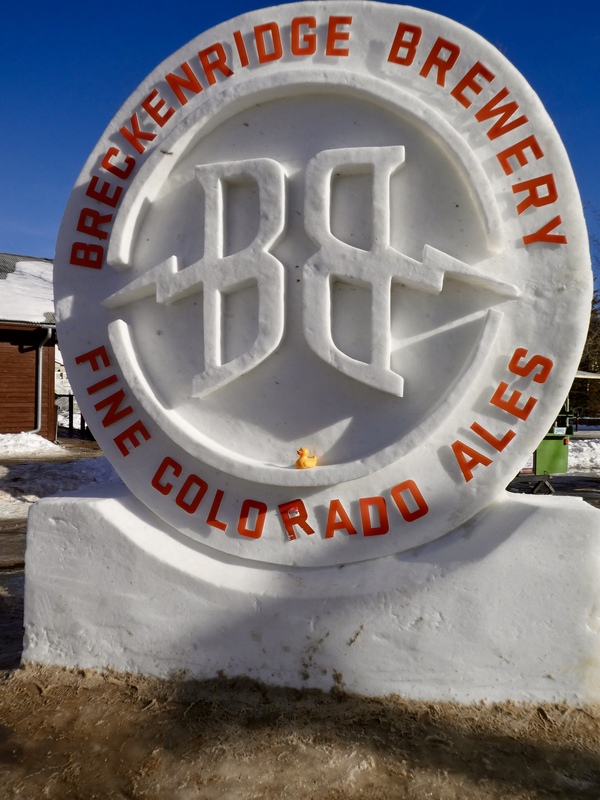 Not been to Breckenridge, I ski mainly in Europe, but I sure am tempted! We love Breckenridge, Colorado. Last weekend in January is usually Snow Sculptures. Many other festivals during the year. Friendly people, great restaurants and shops, and the skiing is fabulous. And living in the Denver area, we have about a 90 minute commute. Hope you visit soon. Thanks for reading and commenting. These are soo amazing! Looks like Breckenridge is getting put on my travel list. 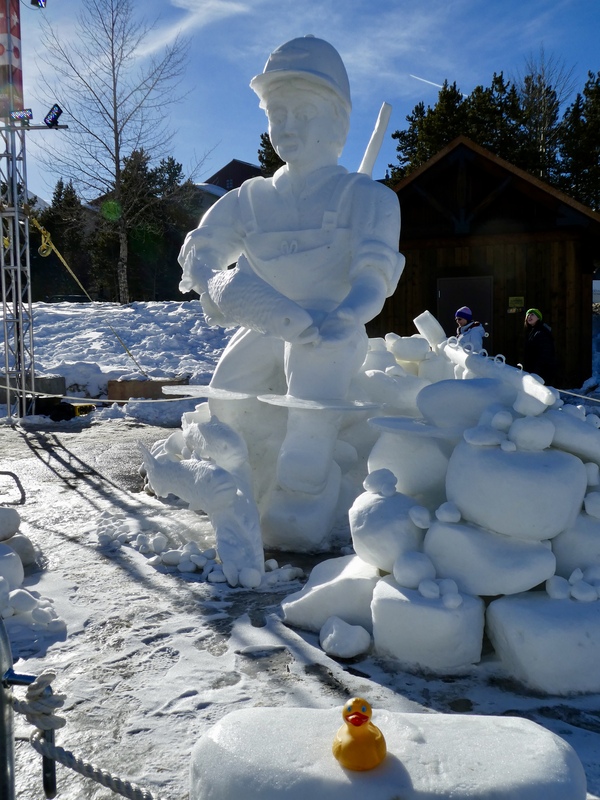 We’ve missed the snow sculpture competition the past few years and I really appreciate seeing your photos. It felt like we were there! Now you’ve given me the impetus to put it on next year’s calendar RIGHT NOW, so that it will actually happen. Thanks, ZTD! 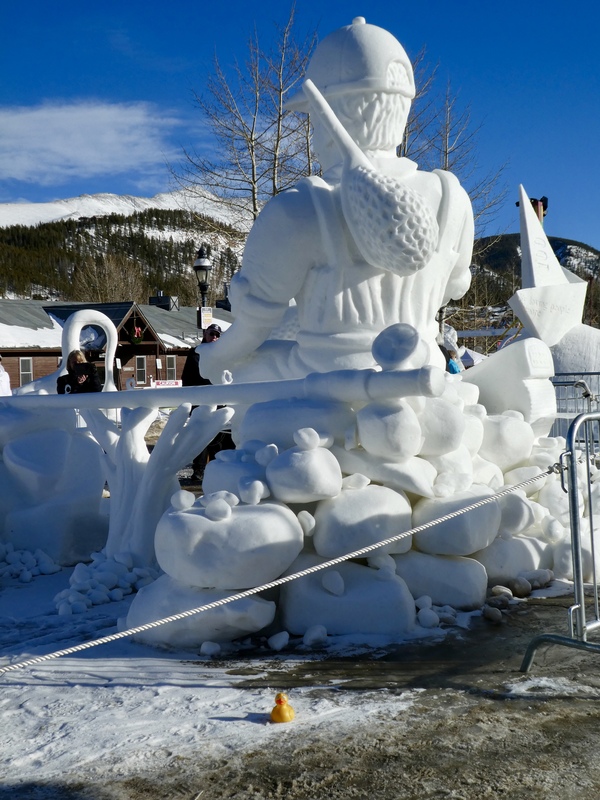 Breckenridge snow sculptures are one of our favorite festivals. Hope we both make it there next year. See you in January. We love snow sculptures. And we love Breckenridge. Great combination for us. Thanks for reading and commenting. these are so cool!!! i like the pictures!